The Caucasus region of Asia was a divided and heavily oppressed area during the Union of Soviet Socialist Republics (USSR) occupation until its collapse in the early 90’s. Soviet attitudes and taboo’s on the subject of its disabled populace were deeply entrenched in the people of the Caucasus region even after its collapse and the countries that now control and dispute its mountainous landscape. Under the USSR all citizens were mobilized in a joint effort to run the country, working in farms, factories, power plants, schools and other parts of the Union’s massive infrastructure. This work was seen by the Soviets as being best done by able-bodied workers and so locking out disabled people from the very centre of Communist society: work. This and the USSR’s already sparse human rights system made it less likely to protect disabled people, who were valued less in society due to the lack of treatment for their conditions. However, the USSR did need to protect their image as a state of equal peoples and did not want to send the wrong message to their populace and so they kept the treatment of disabled people out of the public eye and placed them on the bottom of their budget list, with nearly no money being invested in disabled people or projects to help them live a healthy normal life. After WW2, the Soviet Union had a problem on their hands with hundreds of thousands of disabled veterans being made homeless due to their injuries and lack of support making work for them impossible. So they rounded up disabled veterans from cities and took them to camps where they would be treated in harsh conditions away from the public. This was the same for disabled children who were taken from their homes to special ‘woodland schools’ away from their families and the view of the public. Although every citizen of the Soviet Union had very few human rights, disabled people had it much worse. Their right to a family life and their right to freedom of movement were just two key violations among the many that disabled people suffered. This kind of censorship created the confusion and ignorance behind the stigmatisation of disability in the Soviet Union and later the former soviet-states like Nagorno-Karabakh. The effect of this stigma in the Caucasus region can still, unfortunately, be seen today. One example from Georgia was a situation experienced by Eka, the mother of an eight year autistic child. Eka was travelling on a public bus service with her daughter when her daughter’s excitable behaviour caused the bus driver to become angry and hurl verbal abuse at both her and Eka. Due to this experience, Eka no longer travels with her daughter in public for fear that they will be further persecuted and maybe even attacked. Eka explains, “All I want is to move around the city and feel protected,” This is a clear sign that the stigmatisation of disabled children and adults is still very much alive and kicking and with the continuing lack of education on the subject amongst the population of Georgia and countries in the Caucasus region it is hard to see how views will change. However, there are organisations that are now working day and night to make disabled people ready for society and society educated about them. Each of the Caucasus countries has its own unique difficulties when catering for disabled people to be able to be active members of society like everybody else. Azerbaijan, for instance, is now having to make extensive changes to its infrastructure as a result of Soviet building standards not complying with current building regulations and certainly not being safe or accessible for those with physical disabilities to use. According to Orkhan Adigozal, a wheelchair user from Baku, in an interview with OC-media even using the lifts that are available (which is rare) he needs help getting in and out, “I have to get someone’s help first to get in, and then to get out of the lift”. The whole structure of the city is suited to only able-bodied persons. It is clear that it is not just attitudes that must change but priorities too. Money must be put aside by the governments of the Caucasus countries to be able to fund the massive changes that must take place. Armenia is also currently working to improve conditions for its disabled people. Proof of their work is shown by their adoption of the Law on Social Protection of Persons with Disabilities which was introduced in 1993. This along with the adoption of two UN laws on the protection of disabled people’s rights and the approval of the National Strategy for Social Protection of Persons with disabilities act for 2006-2015 have provided disabled people in Armenia some help, although there is still much more to be done to improve their quality of life. Statistics from the Global Disability Rights Now website and from sources in UNICEF and Save the Children certainly represent the challenge Armenia has ahead of it. For example, 92% of all disabled Armenian’s are unemployed, 72% of disabled Armenian children do not attend school at all and only 25% actually attend special schools, with only 18.8% of all disabled children reaching secondary school. Now more than ever before in the region, taboos and stigmas that had built a wall between disabled people and society in the region are being broken down through hard work, generosity, kindness and understanding. 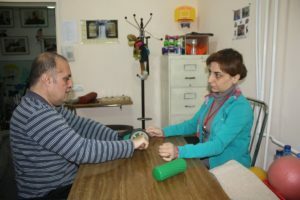 Rehabilitation centres in Georgia, Azerbaijan, Armenia and Nagorno-Karabakh are at the forefront of this struggle providing treatment for disabled children and educating the populace. Additionally, these centres help prepare disabled people for a life as an active member of society giving them a chance to find work and live independently. One of the first of these rehabilitation centres of its kind in the area is The Lady Cox Rehabilitation Centre is run by its director Vardan Tadevosyan and funded largely from donations by the HART foundation which also helped found the centre. Like many of the other rehabilitation centres, the Lady Cox Rehabilitation Centre provides education and support for disabled adults and children suffering from either mental of physical conditions. Rather uniquely, however, is the range of state of the art facilities and therapies the centre has through years of hard work and generous donations that have helped develop its current fantastic services. Such services include a hydrotherapy pool which is used extensively with fantastic results for its patients, with 2,114 sessions having been recorded in 2017 alone. Speech therapy, physical therapy, psychological sessions and home visits are also all features that make up The Lady Cox Rehabilitation Centres work with disabled people. Additionally, Vardan runs a nursery which embraces both children with and without disabilities, dispelling soviet era stigma against disabled people that may develop in children as they grow up and become more aware, as well as a pathway for disabled children to integrate into society. Vardan also helps disabled people find employment, another subject that was taboo during the Soviet occupation. Initially, he employed a blind psychologist for over the phone counselling, acting as an example of how disabled people are just as capable in a work environment as anyone else. The objective of integrating and breaking down the taboos of disability by all the Rehabilitation Centres is what all the work and donations have been going towards. There is no doubt though that the rehabilitation centres, which have only existed just over a decade, are making a difference in disabled people and their families lives for the better and that their continued efforts can only improve the overall welfare and openness of the countries they operate in. 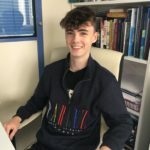 Liam is currently studying Government and Politics, Philosophy and Ethics and History for his A Levels at St. Johns International Academy in Marlborough. He has just completed 3 days of work experience with the HART foundation and is interested in a career involving Humanitarian Aid and/or international relations. Liam has a younger brother with severe learning difficulties and so feels strongly about the improvement of living conditions and rights for disabled people around the world.